Launceston, pop 7000,is the ancient Capital of Cornwall and holder of several Royal Charters. It lies on the Cornwall Devon border, in the far south west of England. To the west lies Bodmin Moor, to the north the rugged Atlantic Coast,with its great beaches. To the East Dartmoor, and the tranquil River Tamar, which runs all the way to the English Channel on the South Coast. Standing guard over the once walled Town is the Norman Castle, with its stunning views for many miles in all directions. Originally there were three arches or gateways to the Town. One of these, the Southgate Arch remains to this day. Beginning in the Square one only needs to take a short stroll through the Town's narrow streets to see buildings of all styles and ages; from Tutor to Georgian to Gothic Victorian. Castle Street has many Georgian town houses, one; Lawrence House is a Museum, containing the history of the Town from prehistoric times to the present day. Full of charming exhibits, including an display of Victorian costume. Another, the Eagle House, is a fine Hotel. The imposing White Hart Hotel in the Square is also Georgian. Many of the properties have interesting frontages, forming an eye catching street scene on every turn. Little details like the town clock, or the boot above a former shoe shop delight, the eye. St Mary Magdalene, dates from the 16th Century, though its Tower is earlier. The Church has a most intricately carved granite exterior. The town contains all the usual amenities of a thriving former market town, including many old established locally owned shops,such as Warrens (the butchers), or Bickles hardware store where you can be guaranteed a warm smile and good old fashioned personal service. Tucked into the medieval streets are several fine hostelries, the medieval Bell Inn, the Westgate, the Launceston Arms, and down the Hill at Newport- The White Horse Inn. Surrounding the Town is gently rolling peaceful countryside. The river valleys are often wooded, and the rivers and streams always unpolluted. Small hamlets and villages dot the area. Many of these are worth a visit in their own right. 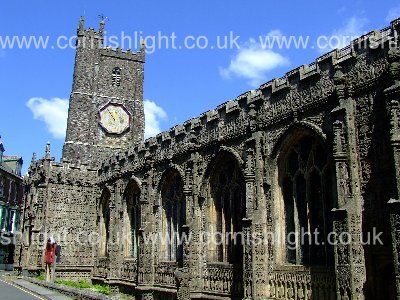 Most have their own pretty parish churches, for example St Briochus , Lezant, or Lawhitton with its Norman Tower. 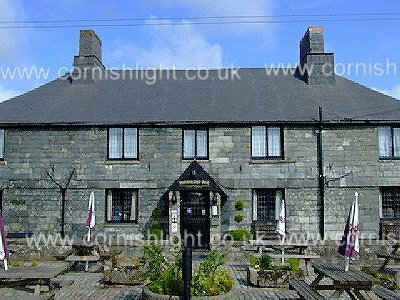 To the west lies Bodmin Moor , with its wind swept granite tors, its isolated farmsteads, and sheltered villages. Also to the west are Dozmary Pool where King Arthur tossed his sword Excaliber, and the Jamaica Inn, an Old smugglers' haunt, made famous by the novel of the same name. Head 15 miles north and you reach the storm tossed Atlantic Coast, where lie charming coastal villages such as Boscastle, Trebarwith and Crackington Haven. 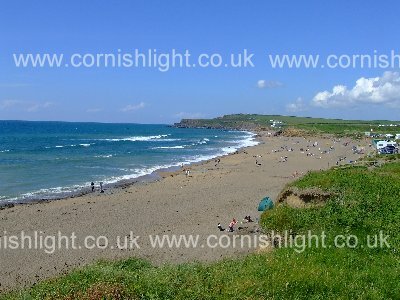 Here you will find high cliffs, and the beaches of Widemouth Bay and Bude. Head south into the Tamar Valley, an Area of Outstanding Natural Beauty, and the country lanes become narrower, the hedgebanks higher. Dotted all along the valley are Ivy covered Engine Houses, all that remains of a 18th Century mining heyday when the area was the "Copper Capital of the World". Providing the only crossing points of the River Tamar for many centuries are several impressive arch bridges, all of which date back to the 15th century or earlier. These were financed from 40 day indulgences granted by the Abbot of Tavistock Abbey, such as the beautiful Greystones Bridge; 3 miles out of the town , and Horsebridge, 2 miles further downstream, both completed in 1437. When the monasteries were dissolved in 1520, the local inhabitants had to then maintain the highway themselves, and the era of fine masonry bridge building came to a close. On the South Coast lies the fishing village of Polperro (29 miles). The Eden Project is just 35 miles away. Or take a day trip to Padstow (35 miles). Feeling fit? Cycle the Camel Trail.